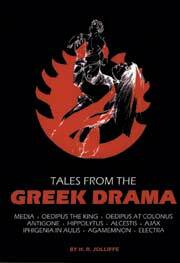 Tales from the Greek Drama provides an excellent introduction to ten of the best known works of Greek drama. The book includes compelling renditions of Medea, Alcestis, Oedipus the King, Iphigenia at Aulis, Oedipus at Colonus, Agamemnon, Antigone, Electra, Ajax, and Hippolytus. Combining the scholar's knowledge of Greek drama and the journalist's talent for dramatic accounts, Jolliffe's retelling of the monumental Greek tragedies allows the general reader to experience the theatrical, emotional, and literary impact of some of the ancient world's finest playwrights: Aeschylus, Euripides and Sophocles. Designed to provide an encounter with, rather than a study of Greek drama, this prose presentation removes the impediments of unfamiliar grammar and syntax, context, and genre. The result is a whetting of the appetite and the building of a firm foundation for a more sophisticated later reading of these works. Tales from the Greek Drama has been translated into Japanese and is currently in its second printing in Japan. A classroom set provides ready access for enrichment activities. Not many people like to read plays, perhaps because the format is sometimes difficult, more likely because it’s a chore to add flesh, blood and scenery to even the best dialog. Even fewer like to read Greek plays and the reason for that is too obvious to mention. Yet the Greeks were the old grand-daddies of them all when it came to writing dramas of violence and tragedy and even some comedy. Everybody knows the names of the great Greek authors - Euripides, Sophocles and the others-but too few know what they were up to. Now comes an old professor of mine to the rescue. Harold R. Jolliffe, a fine classical scholar now a teacher of journalism at Michigan State University, has put some of the great Greek plays into story form. His book is called Tales from the Greek Drama. It introduces you to the era of classical Greece, describes the theater of the day and serves up 10 plays as short stories. Among them are ‘Medea,’ ‘Oedipus Rex,’ ‘Antigone’ and ‘Agamemnon.’ As Jolliffe notes in his preface, the story is the thing and its force lies not in just what happens on the stage but in the effect it has on the hearts and minds of man. Joliffe’s prose is easy reading and offers a good short course in ‘instant Greek drama.’ In fact, if he’d given me this book back in the days when he taught my Greek drama course at Ohio University, I’d have been a lot better off. At that time, it was all Greek to me. A tale from the ancient Greek drama recast in contemporary terms can pack the eruptive wallop of a murder at midnight in the house next door. In this excellent book MSU Professor H. R. Jolliffe retells with admirable narrative skill ten tales from plays by the giants of Greek tragedy — Aeschylus, Sophocles and Euripides. The stories are from Medea, Alcestis, Oedipus at Colonus, Antigone, Hippolythus, Oedipus the King, Ajax, Iphigenia in Aulis, Agamemnon and Electra. …Dr. Jolliffe is extraordinarily well-equiped to do this ‘popularization.’ A sound scholar, with a doctorate in Latin and Greek, he taught the classics, and then became a newspaperman. He combines the scholar’s knowledge of the Greek dramatists, the plays and the language with the ability to write direct, spare, yet moving English prose. For those of us who have had little Latin, less Greek and an almost invincible ignorance of Greek mythology, he has provided a valuable crutch and inspiration. To help us over these obstacles to understanding and appreciation, Dr. Jollife introduces each story with concise, informative remarks, provides brief notes about the characters, and adds instructive afterwords at the tale’s end. A final chaper deals with the Greek theater, its mechanics, its dimensions, its peculiar techniques and forms….